Nothing makes a bigger impression on a property than freshly mulched landscape beds. We will help you get that striking look with either installing a new flower bed or refreshing an existing bed. Mulch will weather and fade in color over time. With a fresh layer on top your beds will look super clean and neat all year long. 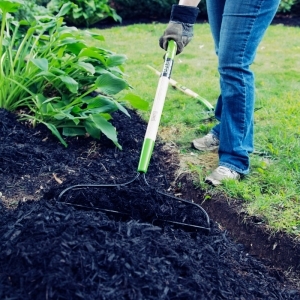 A mulch ring around trees will also protect the trunk from lawn mower or trimmer damage. You can choose from a wide variety of mulch, bark, wood chips or even rocks. If you need advise we are here to guide you. New bed installations will come with professional grade landscape fabric (weed blocker) and edging. Found all of the information you need? Then take advantage of our estimate form and we will put together a detailed estimate for you. I can not believe how good our lawn looks now! He is fast and efficient and his work speaks for itself. I would recommend him to anyone in need of any type of yard maintenance. Rudi is reliable, professional and does a great job. We use him for year around service. We highly recommend him. Rudi was outstanding! All I can say is that his satisfaction guarantee speaks for itself. He's confident in his job and his work speaks for itself. My husband and I are sad we didn't find him sooner. My Personal 100% Iron-Clad, RISK FREE Money-Back GUARANTEE TO YOU! "I want you to be totally thrilled with our service…so absolutely delighted you will recommend us to your friends and neighbours. Frankly, we want to take care of your property forever. You are the judge, if our work is not excellent, we will re-do the item in question for FREE. If you are still not happy, you will not owe us one dime. There's more…If the item in question is not fixed to your total satisfaction we will pay another company of your choice to fix the issue. Nothing is more important to me than your complete satisfaction."